Pond scum is an issue that every pond owner will encounter at some point. How you choose to deal with it will determine the health and longevity of your pond, so it is important to understand all the factors involved with this phenomenon. The term “pond scum” is loosely used and includes a variety of objects, such as floating weeds, plants, and leaves. The term is also used to refer to filamentous algae which create mats on top of the surface of the water. The algae typically form on the pond’s sides or bottom and eventually reach buoyancy that allows it to rise to the surface. This is due to oxygen bubbles which it produces. Once algae reach the top the pond scum will spread rapidly to cover the entire surface, giving it an unpleasant appearance which is similar to a swamp. Pond scum should not be confused with floating plants such as water meal or duck weed. Why Does Pond Scum Appear? 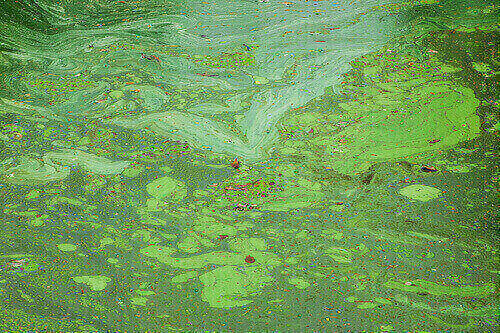 Pond scum results from an increased level of nutrients within the pond. These nutrients are often combined with increased water temperature and extended daylight hours during the summer. Pond scum is also a sign that your pond is deteriorating, and anytime high nutrient levels are present this should be a cause for concern. Things which contribute to the presence of increased nutrients include overfeeding, failure to clean the pond regularly, dirty filters and overstocking. There are various things you can do to prevent and eliminate pond scum. Many pond owners resort to using chemicals, since they are fast, relatively effective and don’t cost much. Unfortunately, chemical treatment is not a good solution long term since it merely hides the pond scum for a time before it reappears on the surface again. To get to the root of the problem you may have to do extensive cleaning or hire the services of a professional. The groundwater runoff may need to be redirected, and you should remove any grass clipping from the pond water. Another brilliant solution is the installation of plants into the pond which consume nutrients. Adding shade to prevent the pond from being exposed to excess sunlight is another option, as is using bacterial treatment. To permanently prevent and resolve pond scum, it is wise to look for solutions that get to the root of the problem as opposed to dealing with its symptoms. Additional tips for getting rid of pond scum permanently include not over-feeding the fish, replacing your filtration systems, enhancing circulation, including aeration and reducing the stock that is present. The good news is that pond scum in backyard ponds is relatively simple to fix once you understand the underlying cause as well as the solutions. Before resolving the problem you must first diagnose it, and then enact the procedures which are needed to correct it. Remember; even after the problem is resolved, ponds require regular maintenance or else the pond scum will appear again.